Thanks to our Tech team and all partner startups who have leveraged our brokerage as a service model, we have been able to build many products over the last few years. Hopefully, you are enjoying using them as much as we are building it for you. Visit https://zerodha.com/investments to check out all the instruments you can trade at Zerodha and all products that will help you with the same. Sentinel is a platform that allows you to create real-time market alerts across 80,000 stocks, bonds, commodities, derivatives, and more. Unlike other platforms out there all your alerts reside on the cloud and you’ll receive alerts once triggered no matter where you are. Sentinel also allows you to combine multiple complex conditions (Open interest change, % day change, etc) to generate alerts. Sign up in November to get one month of Sentinel Pro for free. 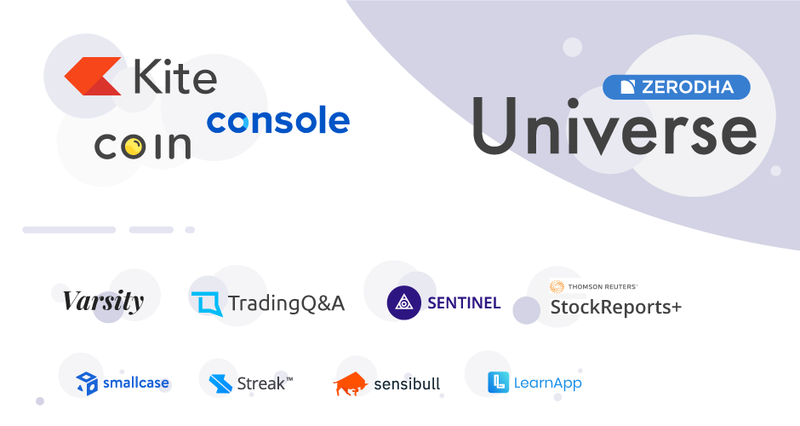 Sensibull is India’s first options trading platform, offering everything from simplified options trading for new investors to powerful trading tools for the pros. It allows you to build and trade strategies, track real-time P&L and Greeks, spot trading opportunities with IVs, IV percentiles, Events, Volume Breakouts, OI Buildups, PCR and a whole lot more. Signup here to enjoy one month of free access to all features of Sensibull. smallcase is a thematic investing platform that helps you invest in intelligently-weighted low-cost portfolios of up to 20 stocks. Each smallcase is designed to help you capitalize on a theme or trend. This Diwali, you can invest in All Weather Investing & Smart Beta smallcases for no fees for lifetime. Also, invest in any 1 thematic/model-based/sectoral smallcases for zero fees. To see what offers you are eligible for on smallcase, log in now. No fees charged for screener Pro users paying via Zerodha funds in November, also all new users can take a 30-day free trial anytime this month. Streak is an algo trading platform that helps you create, backtest, and deploy algos live in the market without coding. With Streak’s intuitive strategy builder, you can create algos, backtest them to measure their performance, and deploy then live in the market in just a few minutes. Streak is offering 20 backtests and 2 algo deployments per day up to 30th November for free. Do try it out. LearnApp makes high-quality financial education taught by industry veterans and leaders accessible to everyone. The meticulously constructed courses on all things finance are taught by some of the biggest names in the industry such as S Naren (CIO, ICICI Prudential AMC), Archit Gupta (Founder, Cleartax), Gautam Magoo (Former partner, Sequoia Capital) among others. Register here for a 3-day trial access to LearnApp. Get one Month extra access if you subscribe after the trial and 3 months extra if you subscribe to the 12 month plan. StockReports+ by Thomson Reuters is a comprehensive report on over 3000+ Indian stocks. Each report is packed with insights ranging from relative valuations, earnings estimates, industry and sectoral analysis to proprietary ratings for factors such as risk, price momentum, earnings, valuations, and more. You can subscribe (first-time users only) to StockReports+ for free all this week. Try it now! Do keep tracking https://zerodha.com/products, we will keep it updated with all new product launches. Hoping that the Hindu new year brings you a lot of health, wealth, and happiness. Happy Dewali. Excellent journey of Zerodha in a very small time.Wish you great days ahead. Zerodha is a nice platform to trade. Zerodha universe is any plat form trading process. It may happen if you have not submitted your POA. Please check your email. You may have received one regarding sending your POA to zerodha. Happy Diwali to Zerodha Team. Brilliant, I find it very interesting on Streak, Sensibull and Learnapp. Is there any Scanner option available. Well platform….zerodha is the best..trading platform. Why zerodha has charged brokerage on muharat trading deals when it was said as free. What does free means? I like the feature set. However, one question for “Sovereign gold bond scheme”, how can one cancel order? I decided to buy on next issue. Kindly guide. Could not find relevant page for that. Tq NITHIN. This is some thing what I have been looking forward since long. It’ll be very useful and handy to all the stake holders. You have made Zerodha most powerful indian trading platform. Thank you for it. According to me if one thing added in Zerodha Kite then it will become forbidden Plateform for everyone-Top Gainers/Top Losers segment wise. This is must have feature in every trading Plateform. 1. Add sorting feature on Kite Mobile for Order Book(Pending/Executed). It has been a pain to see pending order book in Kite Mobile. At least provide a search feature immediately..
2. Provide GTC orders or at lease provide an AMO repeat order for multiple pending orders in single click. 3. Real time mobile alert or SMS for executed orders. 1. Passing this feedback to the Product team. 2. We are building Good till cancelled orders. Should be out soon. 3. Mobile notifications will be part of the next Kite App update. If still there is any problem kindly let me know. WHY CHARTING DATA IS DIFFRANT TO OTHERS ???? Great News, if possible make it accessible for longer period(6 months) so can explore in details. Wonder, if any Training session available to have maximum benefit of this. Happy diwali, I was purchased and sold some share and added funds on 03 Nov 2018. But not profit credited on my account. I am approax 40000rs in loss in eyuity,kindly help. Why buybacks are chargeable now? (Rs. 20 + GST). This month brockerage also free on kite????? Appreciate if I can have training sessions on trading. Worst exp.. My holdings are not showing in kite..
You, Your Team & Partner StartUps are Truly Genius, who all have Meticulously Designed Zerodha Universe Softwares / Platforms. These all tools are really a big boon for all the retail traders / investors. And it’s free trails is like sweet icing on the cake. Happy Samvat 2075 to All! Zerodha kite is a fantastic software l use smoothly . They have developed with their team with sincerity and versatile genious. Sir can u plz make this free trial session available next month…. Kite app mein abhi bhi sare features add karna baaki hai aisa muje lagta hai, usme history nahi dikhti, account mein abhi tak kitne paise daale and kitna profit hua. When trading charges are deducted. Every day or once in a month. Presently Zerodha does not adjust the price subsequent to issue of bonus shares. This is a big problem. Profit and Loss is not working properly. This becomes erroneous as bonus shares sale does not get reflected. When can we apply for IPO / OFS / BUYBACK in zerodha ? 1 & 2. The buy average is not halved to give you the taxation advantage called bonus stripping. This article explains this is in detail. 2. You can apply for all OFS and Buybacks through us. This bulletin is updated with all buybacks. OFS orders are accepted on Q-back office during the bidding period. We cannot allow IPOs as we are not an ASBA supported bank. SEBI is soon bringing in regulations to allow bidding using UPI, which will enable us to accept IPO bids too. Your answer is not satisfactory. By not adjusting the purchase price after issue of bonus shares, one has to calculate and keep a manual record. Your article is of no use. All companies offering demat and trading account do adjust the purchase price. Zerodha should also do the same. If you don’t do this P&L statements in you r report will be incorrect and will be useless. If you truly want to help , do adjust the purchase price after issue of bonus shares. Without this your P&L reports are UTTERLY USELESS. The purchase price of a stock is not adjusted for the tax benefit, as Faisal has mentioned. This benefit exists in the first place because the purchase price simply does not change! When you receive bonus shares, you’re essentially receiving shares at 0 cost from the company for holding their stock. The market adjusts to account for these shares being issued, however, your original purchase price still remains the same. For example, let’s say you buy 10 Reliance for Rs. 100 apiece. Your buy average is 100 and total cost of purchase is Rs. 1000. Now, a month later, Reliance issues a 1:1 bonus. Assuming the stock is still trading at Rs. 100 pre-bonus, it will start trading at Rs. 50 ex-bonus. However, this does not change the fact that the stocks you bought cost Rs. 100 or that you paid Rs. 0 for the bonus stocks. You see? Hence, it is more prudent to leave the purchase price untouched in case of a bonus. After issue of bonus shares, in holdings, total number of shares (incl. bonus shares), but average cost ie purchase price is not shown. After sale of shares both original and bonus shares, P&L statement shows loss against original shares. Bonus shares sale P&L is not shown (ie. bonus share sale price – cost price which is zero ) is not shown in P&L statements. I have experienced this with respect to sale of bonus shares for the past one year. Almost all the brokerages houses adjusted average purchase price of shares. Bonus shares sale P&L also is shown. So there is no need to manually calculate P&L of bonus shares. Whats special about zerodha not to follow the method followed by other brokerage houses. Rather than rectifying the discrepancy, vague answers are given justifying their method. One question, why to restrict trial with just one month? Why don’t you provide trial with a coupon? One can keep the coupon till one want to redeem it. The day one feels like checking out a service, one could use that coupon to redeem a one month free trial prior to purchase? I am requesting for this because a lot of people wouldn’t be able to use all the platforms properly in just one month and the platform wouldn’t get as much exposure. I myself know nothing about “options” yet. Though you are providing Sensibull free trial but at the moment its of no use to me. With coupon like thing, one would be able to use each platform one by one and would be able to understand them thoroughly. Me too feels the same…..And have the same opinion…. Request to give enough time to explore..Each product…Also appreciate Zerodha for such free offer.. The free trial is to promote all our products at once which not all our clients are aware of. Where can the terms and conditions regarding blocking shares in my account and creating limits for trading in Equity and FNO be seen? we want help line number.please send me. The report is good. I am an account holder of Zerodah for a long period of time. But I am sorry that I am still not able to understand the system for a successful trading. Also, there should be a system to contact customers to meet their needs for successful trading. Sir , zerodha Pi is not being updated. It keeps crashing on windows when we open charts. I raised a issue but no response. Zerodha pi is just left to rot. smallcase and StockReports+ are excellent products. The choice of the stock picks in smallcase are helping us to identify good stock picks. One can spend hours on StockReports+. Screener is not so helpful so far. Zerodha Rocks, truely this platform has zeroed away all the problems that the traders were facing before Zerodha. Nitin Sir, thank you so much for providing something which I could only wish or deram before, I salute all you for your endeavors. Thank you very much ! I started trading with zerodha. Everything is ok but exposure is very very less which is disappointing fact. Only rich traders can trade in Zerodha. Here I am getting only 2 times exposure while my one friend is trading with other brokerage account. He is getting 30 times exposure. It is too much disappointing for me. Would be great if Zerodha can introduce flat monthly fee for unlimited transactions. Current fee of Rs. 20/- for each transaction is limiting the profitability for small intraday traders with less capital. Only those who trade in big amounts can make profit if this continues. Unlimited transactions with a monthly fee will give the flexibility to exit early due to lower break even point. For this reason I stopped trading since few months now, and I don’t intend to continue with this platform. Love the Kite application though, good job by Zerodha on that. In streak, order placement is done automatically by system or human intervention is required. As per regulatory framework, you have to confirm the Buy or Sell action. It cannot be automated. We have our android and ios app which makes algo on the go very easy. You can deploy algos anytime eg : even on a Sunday. Excellent! Will try some of them this Nov. Happy Diwali to Zerodha family. I’m a student & new in stock market with low investment fund. So in my mind two questions arise. 2.From review, I saw that when someone going to open account with Zerodha they wants “Power of Attorney”. Why such document they wants when all the privacy is lying in that type of document. Anyway all the services are according with my requirements.So If the above two confusion of my mind are solve then I’m going with Zerodha for opening an account. Hope soon I will get my answer. Found no care of customs, i have opened an account couple of weeks before but stil no one contacted from Zerodha, no RM no customer care number provided. Nandraj, we don’t have a relationship manager model. You can always contact our Support team by calling 080-40402020/33102020. Also, all your queries are answered on support.zerodha.com. Please add G-SEC in to coin app and Android app asks login every-time when i opens with KITE App and SmallCase, coin apps works awesome with out any issue. We do intend to add G-Secs to the Coin app in the coming releases, Prabhakar. As for logins, Kite and Smallcase are platforms to place orders on the exchange. The exchange requires that the user logs in afresh each day, hence the difference in behaviour. Are the Kite Connect and Historical data APIs part of this free November offer? “You don’t have to be a hero to accomplish great things—to compete. You can just be an ordinary chap, sufficiently motivated to reach challenging goals.” An excellent quote applies in every walk of life. WISH U ENTIRE ZERODHA, “HAPPY DIWALI”. I will first go through them. Lot of offers,but NO PROFIT.Only loosing money!!!! well i looked all the services which you have provided above but i was disappointed to see there was no single site dedicated for maintaining trading journals . there is no service even provided by the zerodha to download all the data required by the stock broker in the form of csv file. It really becomes difficult to analyze mistake which we do as a trader. i hope you guys take a much needed step in this direction and can learn from sites like – tradesync.com , tradervue.com etc ! for the betterment of your customers . A trading journal is on our list of things to do and should be made available as a part of Console soon, Ashish. Streak is not allowing me to use service for free. I did subscribe it earlier…though did not use it and then cancelled subscription. Is it not free for past subscribers? Please do write to support[@]streak.tech with your Kite Id and we shall solve this issue. I have activated my zerodha accouant about 15 days back. Neither have i been able to add the money into zerodha account till date. Also request if you can arrange a training as to how to start trading with zerodha as i am using icici direct platform for the last 10 years and wish to move completely on to zerodha. Please help. 2. Some products are offshoot made from feature, they should remain in core product, customer knows he is been fooled. 3. 1st 5 years of new business spent in making dozens of product, next 5 years will be spend in consolidating the same products. Hey Arun, the primary product offering, Kite, our flagship trading platform, was built with the idea of making available a clean, noise-free trading platform with just the essentials. The additional features are kept out of Kite and treated as value-adds because that is what they are. The reason for Kite being as minimal as it is is explained here. ZERODHA is best and user friendly platform for trading and reasonable brockerage rate. Thanks Kamath Sir. Wishes to all Zerodha ltd. Team for our progress & well support to traders. I am new trader fully satisfied from our co-operation. wishes to all ZERODHA Ltd team.I open new account in Zerodha. I hope Zerodha is best for all trading. Is there any tool available in the market to calculate real value of a stock. Depends on what you mean by “real value” but you can check out https://zerodha.com/varsity/module/fundamental-analysis/ and https://stockreports.zerodha.com. I am a novice trader and my question is very basic. If i have 10 shares of abc co. , Can i short sell them and make profit out of it. ? Hey Bunty, you can short sell stocks you hold. but you’ll have to cover the short position by the end of the day if you wish to continue holding the stock. First, let me say a big THANK YOU to you and your entire Zerodha team for bringing us the best apps to support our trading. Now that you have covered us from almost all sides, the one that is pending now is the Screener app. I would love to pay for an app that filters stocks (cash as well as futures) based on user inputs on real-time basis. Example: An app that filters stocks in real time that have say 7 SMA cross above the 20SMA. Something like chartink. sir….please commence trading in Government Gold bonds on the platform. I have missed purchasing them during the Diwali during the initial offer. Tried to purchase online, but the trades were cancelled as the trades were not allowed. Also please commence trading on Agri products as the same are now becoming popular. Hey Akshay, Gold bonds will be available as soon as depositories are ready with this. Currently, there is an issue with inter-depository transfer for these bonds and the depositories are working on having the fixed. Thanks for the request, we have added this to our task list, btw we already have Fibonacci pivot points. I was so skeptical of stocks trading, but now could dare to start trading just because of Zerodha. Kudos to entire team! Thanks much! first you send dis book for share transfer..instead of sending so many requests your peooples declined and not doing ie not attending my request..more over please maintain customer relation service in good mannar ..
You can create a platform for international trading. It’s a suggestion. I love zerodha, it’s my first and will be my last platform for stock market for sure. I have tried to open account since last week. There’s some issues happening with opening my account. I have already paid the account opening fees of Rs. 500/- last week but no one is helping me. Even I tried to reaching out your sales executive but he is Sick so not responding (like number is coming switch off). Even I also tried the Zerodha number but there it’s asking client ID which I don’t have it and not able to reach out anyone to Zerodha. So, thinking if I write here someone can see my comment and help me with my issue. Please help me to open the account as soon as possible. need to add some features like GTD order, support and resistance for each stock in watch list as well as in holdings. holding price should include STT, GST, Stamp duty and other additional charges same way it should be reflected in sell price. Please fix this biggest bug of kite. Kite–> order page–> option(3dot)-> menu window going out of screen . every time we need to scroll order page to click on option menu. dont know how to send screenshot here. Rajesh, looks like a device specific issue. Can you create a ticket here with a screenshot along with the device/browser you are using? This comment is for the backtesting product streak . the promise was great but the product is a restricted one. 1. the period of back testing is less than a year. 2. the flexibility of the criteria used for back testing are also limited. not worth the subscription . You can run backtest ranging from 200 to 1000 per day depending on the paid plans. Depending on the candle interval, you can go to the backtest result page and edit the time period. The statement showing in console is not looking as good as should be due to background theme white, I always download it to see the details, if possible pl mention date & time against each scrip and simple to see on web page. With regards to Console theme, We’ll take this as feedback and pass it on to our developers. For the P&l report with date and time, download the Tradewise tax p&l reports from https://console.zerodha.com/reports/taxpnl/eq. You can see the date and time against each scrip even on the tradebook as well. Thank you for your Zerodha trading platform and also for taking interest at ground level issues and feedbacks even though you and Zerodha has outgrown beyond imagination. Are you planning to provide any stock advisory service/subscription or stock recommendations/valuation for Zerodha subscribers in future with small fees? Zerodha will beacome the world’s best stock broker.